Climate change will have direct impacts on human health. A recent report describes the kinds of impacts that might occur, and identifies populations that might be affected, but mostly doesn’t predict how rates of death or illness will change. For some time climate scientists have been warning that climate change might have direct impacts on human health in the United States. A 2016 report, based on the National Climate Assessment completed in 2014, the U.S. Global Change Research Program writes that it will directly affect human health in 7 basic ways (see Figure 1). Each of these 7 ways is a summary of several different health impacts. For instance, the air quality chapter analyzes the impacts of changes in atmospheric ozone, airborne allergens, and exposure to indoor air contaminants. In addition, the health effects of climate change are expected to impact susceptible populations more severely than others. For instance, those with asthma or COPD are likely to be more heavily impacted by changes in air quality than the general population. The health effects of climate change will be related to exposure. For instance, regions where more people die of exposure to cold during the winter than heat during the summer may actually see a decrease in annual temperature-related deaths. And finally, some of the health effects of climate change will be impacted by adaptation. Simple, every-day, and potentially life-saving examples of adaptation include heated buildings during the winter and air conditioned buildings during extreme summer heat. The more adaptive resources individuals and communities have, the more they will be able to mitigate some of the health effects of climate change. In most cases, the state of knowledge has advanced to the point that health scientists can model predicted changes in exposure to some harmful effects. For instance, the chapter on water-borne diseases models extensions in the range of several water-borne bacteria that will be caused by climate change. 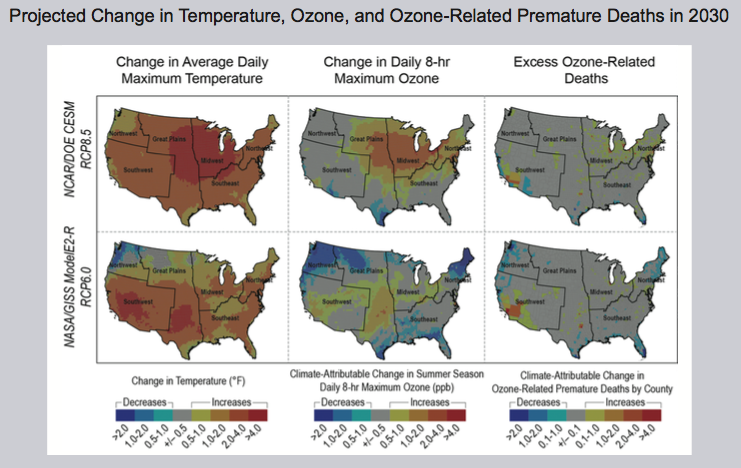 However, only in two cases has knowledge extended to the point where health scientists could model the change in the number premature deaths: direct temperature-related exposure and ozone exposure. Two kinds of temperature cause temperature-related death: cold during the winter, and heat during the summer. 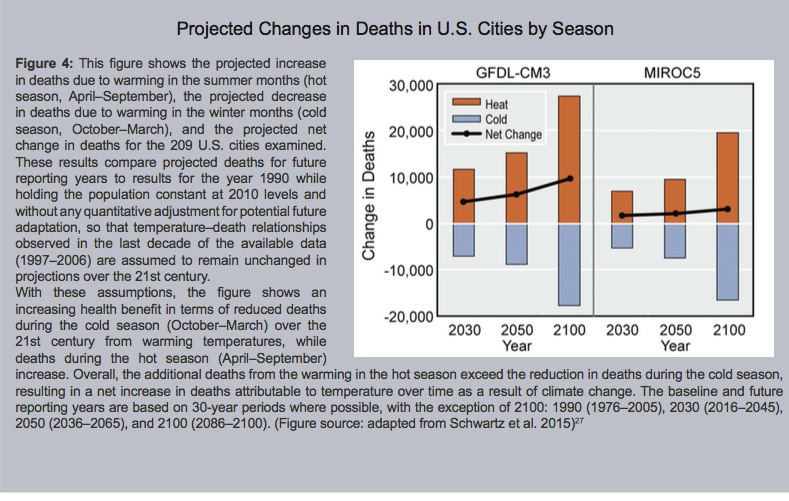 Climate change is expected to cause warmer winters, leading to a reduction in cold-related deaths. It is expected to cause warmer summers, however, leading to an increase in heat-related deaths. The net impact is shown in Figure 2: a net increase of about 4,000-10,000 nationwide, depending on the model used. The changes will occur predominantly in cities. Increased ozone levels are expected to cause an increase in ozone-related deaths, primarily in large urban areas (Figure 3). This is ground level ozone, not the antarctic ozone hole in the stratosphere. For a brief discussion of ozone, see this post. Ground level ozone comes primarily from burning fossil fuel, either in vehicles or power plants. Both St. Louis and Kansas City have significant ozone problems. Fortunately, the number of excess deaths is expected to be relatively low in most of the country (less than 2 per county) . The projection goes only through 2030, however, and the real impacts of climate change are not expected to kick in by that time. What may occur after that is not modeled in the report. In this country 30-35,000 of us die in motor vehicle accidents each year. There were 73,505 non-fatal firearm injuries in 2013, and 33,636 fatalities. These statistics put the predictions from the USGCRP in perspective. 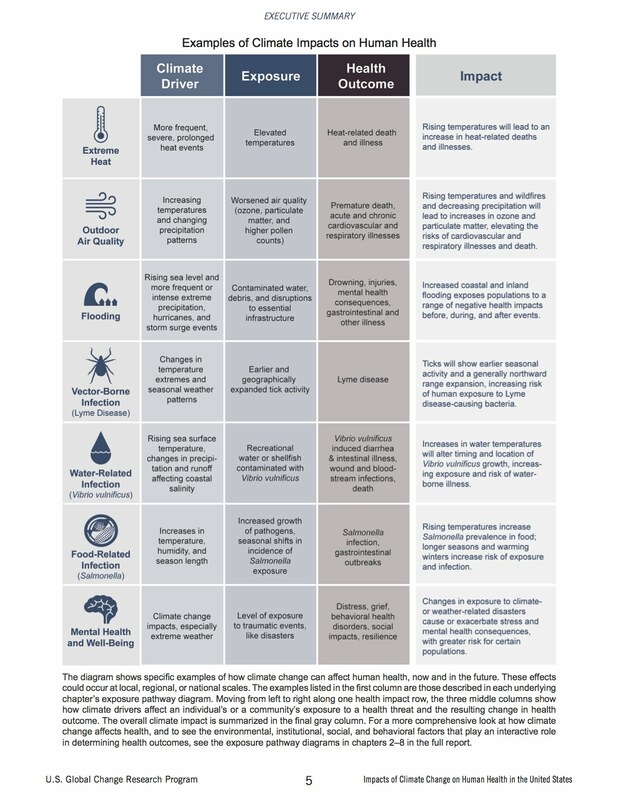 In summary, the report identifies ways in which climate change may impact health in the United States, and it models how changes may occur in exposure to important harm-causing factors. It does not describe very large health impacts, but the state of our knowledge does not yet allow for many certainties. There are going to be significant increases in exposure to potentially harmful conditions, but their eventual impact seems to remain unknown. USGCRP, 2016: The Impacts of Climate Change on Human Health in the United States: A Scientific Assessment. Crimmins, A., J. Balbus, J.L. Gamble, C.B. Beard, J.E. Bell, D. Dodgen, R.J. Eisen, N. Fann, M.D. Hawkins, S.C. Herring, L. Jantarasami, D.M. Mills, S. Saha, M.C. Sarofim, J. Trtanj, and L. Ziska, Eds. U.S. Global Change Research Program, Washington, DC, 312 pp. http://dx.doi.org/10.7930/J0R49NQX. Wikipedia. Gun Violence in the United States. Viewed online 11/17/2016 at https://en.wikipedia.org/wiki/Gun_violence_in_the_United_States. Wikipedia. List of Motor Vehicle Deaths in U.S. by Year. Viewed online 11/17/2016 at https://en.wikipedia.org/wiki/List_of_motor_vehicle_deaths_in_U.S._by_year. By mogreenstats in Climate Change, Other Climate Change on 2016/12/14 .